The State of Iowa recently changed its workers compensation law (Iowa Code 85.1A). Effective July 1, 2015, Iowa law requires sole proprietors, partners, limited liability partners and limited liability company members to declare if they intend to be covered or not by workers’ compensation. 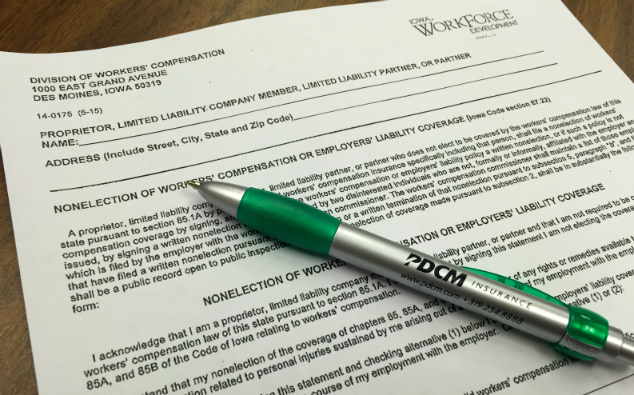 If you currently have a workers’ compensation policy that does not cover you as an owner, you must complete and sign (and have witnessed) a Nonelection of Workers’ Compensation or Employer Liability Coverage form (14-0715 (5-15)) and file it with the workers’ compensation commissioner in the State of Iowa. Also – If you contract work with subcontractors, it is good business practice to demand proof that they have general liability insurance and workers’ compensation coverage. You should request a certificate of insurance showing these coverages. Proof that your subcontractors are insured may be requested by your workers’ compensation carrier at audit time. Failure to have proof may result in you being charged for this exposure. Protect your business and minimize your risk with help from PDCM Insurance. All of our business insurance consulting experts can review your workers’ compensation situation and offer solutions tailored to your business. Call us today at 319-234-8888 or email us at commercial@pdcm.com.